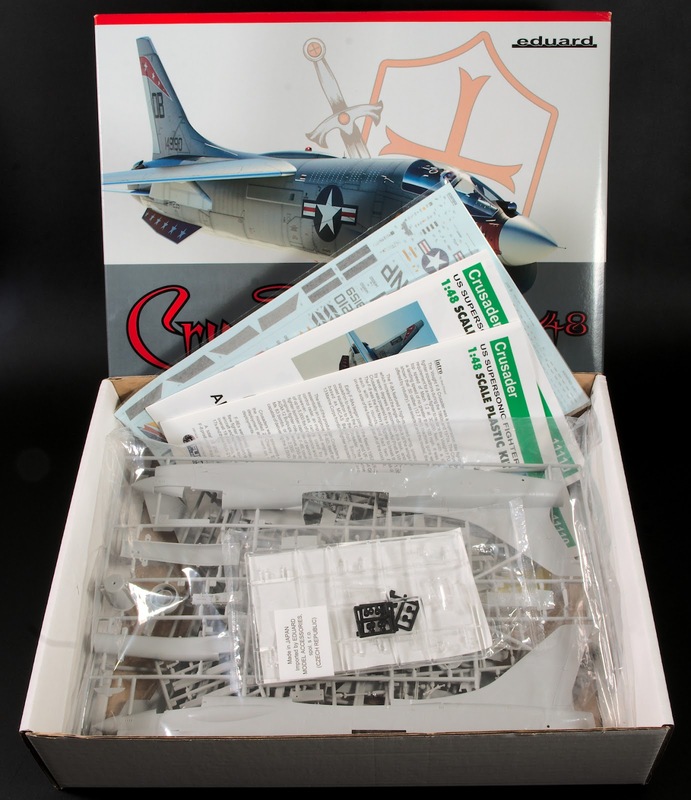 One of the nice things about the Eduard Limited Edition boxings is that they include many of the photo-etch and resin goodies that Eduard have created for the base kit, in this case, the Hasegawa F-8. 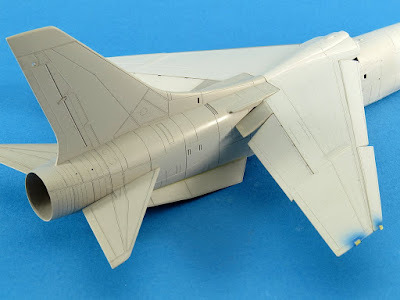 As I plan to display the wing in the open position the extra detail provided by the PE parts, both internal and external, is quite welcome as the plastic parts are fairly basic. 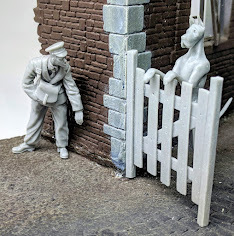 When working with unpainted PE I like to lightly abrade the brass surface with some fine wet n' dry paper. This helps later with paint adhesion and also helps the CA glue adhere to the brass. 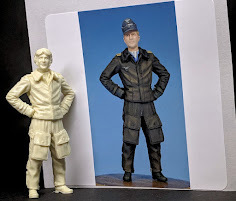 To test my work and prepare the brass and plastic parts for later paint coats I have applied a generous coat of Tamiya Fine Grey primer. Note also the extra rivet surface detail that has been added around the top panels. 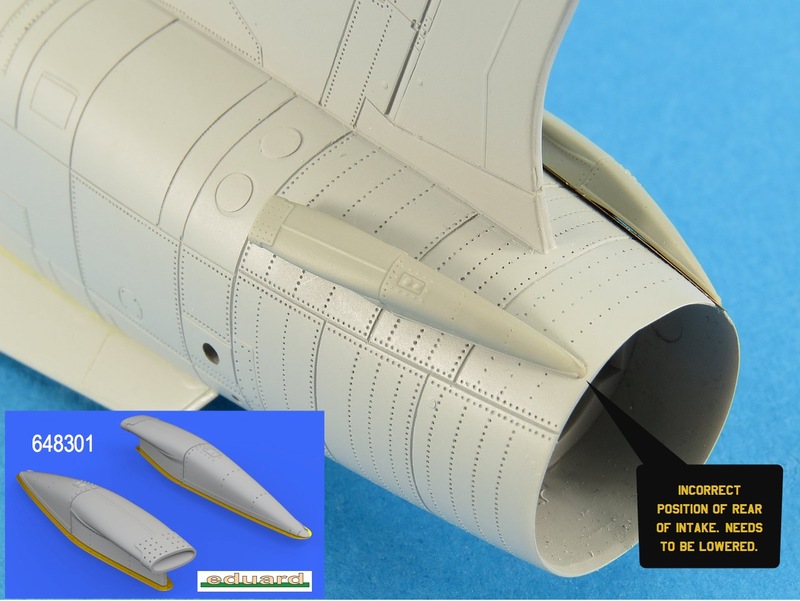 The PE set also includes several replacement panels for the fuselage underside which help enhance the various access panels found here. 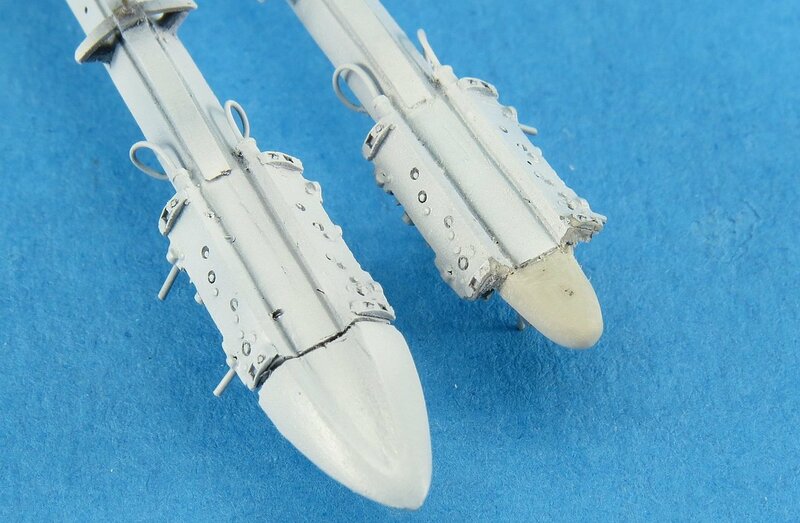 I prefer to use slow setting CA glue for parts like these as it gives more time to get them aligned properly. 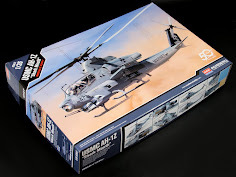 Many of the panel lines seen here have been added by me as the kit plastic detailing was so shallow or distorted I sanded it off. When adding recessed rivet detail there are several methods I like to use to ensure the rivets are properly spaced. 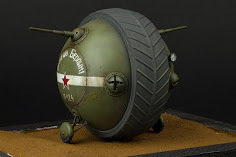 You can, of course, use a rivet wheel, but when the rivets needed are very widely spaced the wheels are not much use. 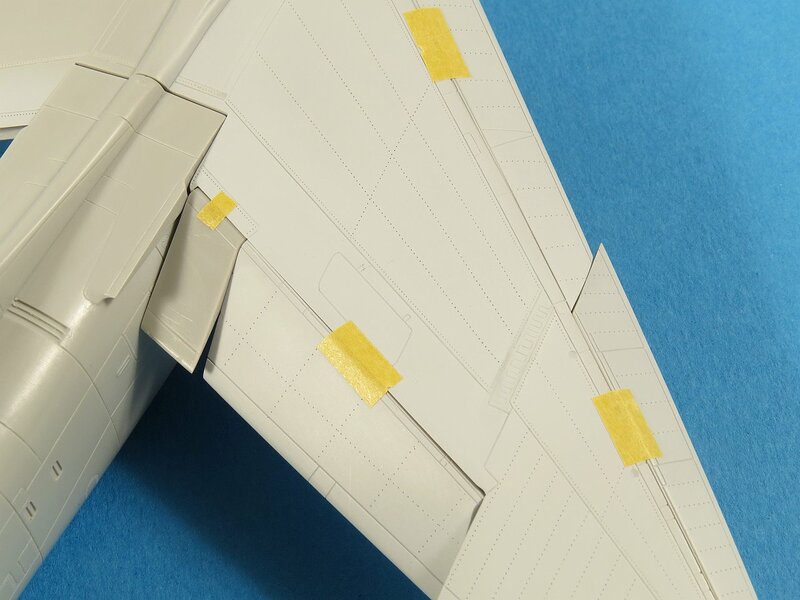 One tip is to use a ruler to mark out the spacing you want onto a piece of tape. 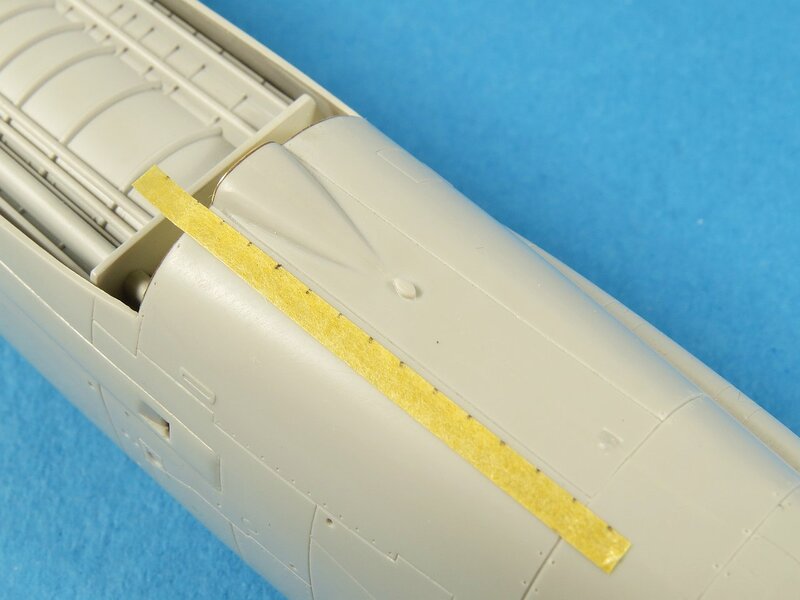 Lay the tape on the surface of the model where the rivets are required and then use a sharp tool or pin to add the rivets using the edge of the tape as a guide. 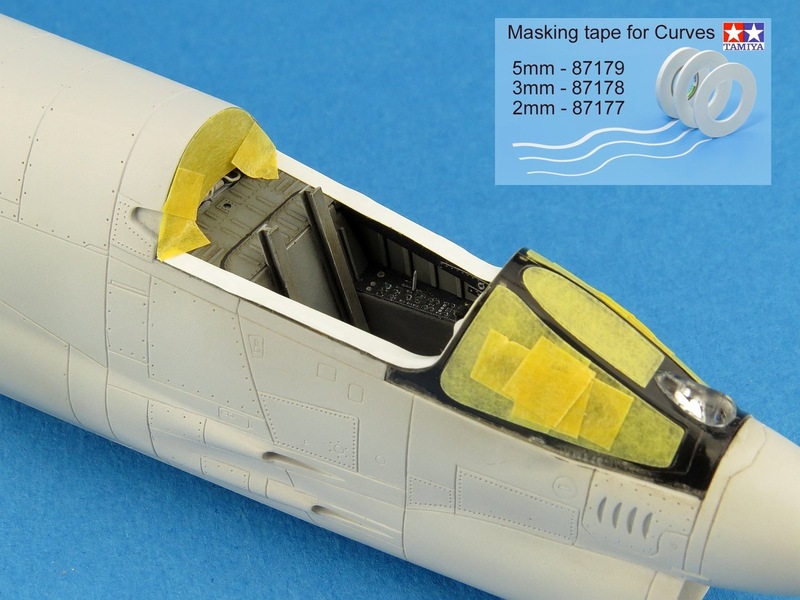 This is a particularly useful technique for laying out rivets on curved surfaces as the tape marks ensure the spacing is consistent around the curvature. For laying down rows of rivets as found on the metal skin of aircraft, there is no better tool than a good quality wheel set. I like to use the Rivet-R Mini from RB Productions. 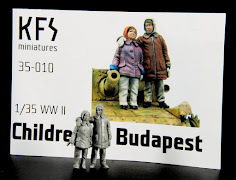 These are made from photo-etch steel and are very precise. The wheels come with a holder designed to fit a standard knife handle and you can purchase additional holders for each sized wheel. 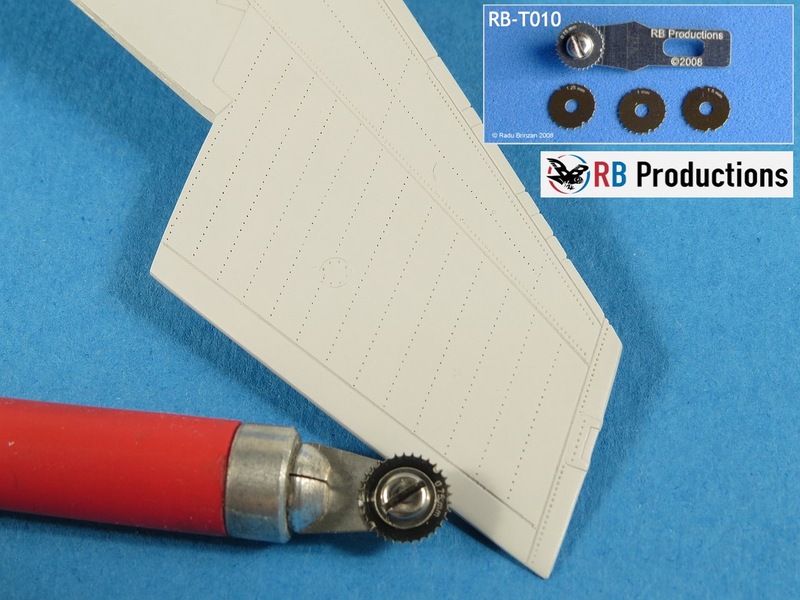 RB produce wheels with rivet spacings ranging from 0.55mm to 1.50mm. 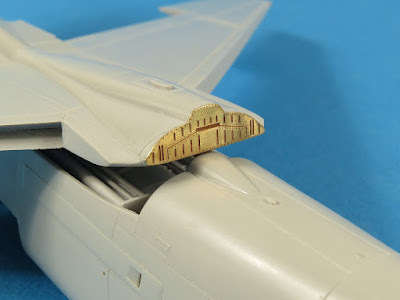 For the rivets on the Crusader wing, I use both the 0.75mm and 1.0mm wheels as I find these look best for 1/48th scale. 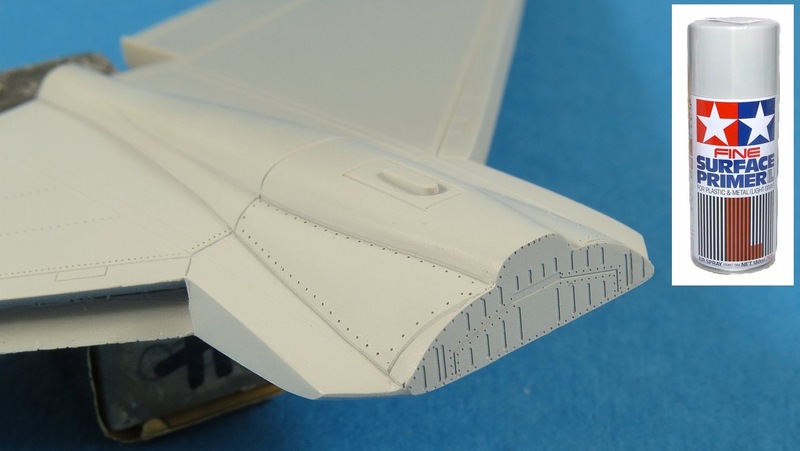 The control surfaces (flaps and slats) have received their own rivet runs. There are many techniques to achieve nice straight lines when using the wheel. I find that laying down a strip of masking tape along the line you want to rivet and using its edge as a visual guide to sight along when rolling the wheel works very well. 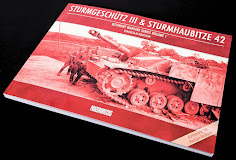 Once the surface detailing work was complete I turned my attention to the stores and weapons. In this case, I plan to have a full bomb load on this USMC Crusader. 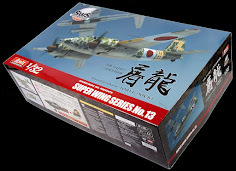 The kit does come with the wing pylons but in typical Hasegawa fashion, no actual weapons are included on the kit sprues. 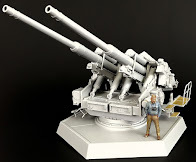 It would have been nice to see Eduard throw in some of its very nice Brassin weapons as these would help ease the pain of the cost of these limited edition kits. 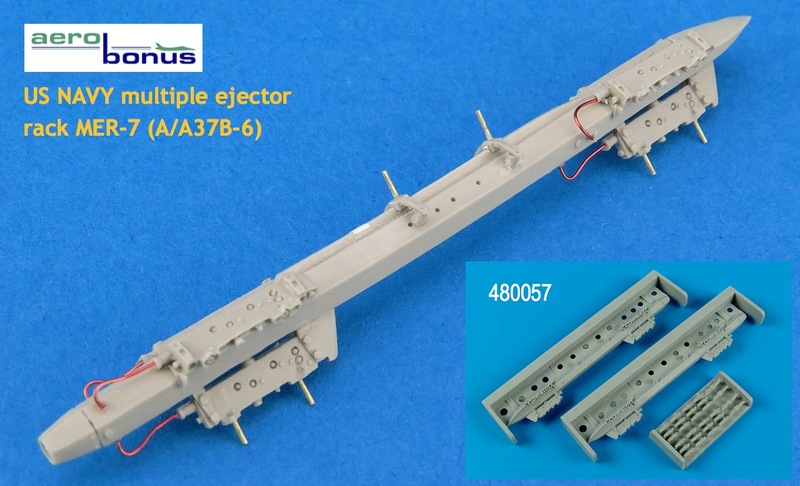 I sourced a MER (Multiple Ejection Rack) from Aerobonus and a pack of six Mk.82 bombs from Eduard. I like to pin (using brass) all bombs onto their pylons for strength and to ensure perfect alignment. Nothing looks more distracting than that one crooked bomb. Copper wire was used to add some of the control wires found on the MER. A wider shot of the finished MER. The rack is designed to carry 6 bombs but when used on the F-8 was only loaded with 4 bombs. This was due to the Crusader's wing pylons being very close to the fuselage and any inner bombs could not be carried safely. 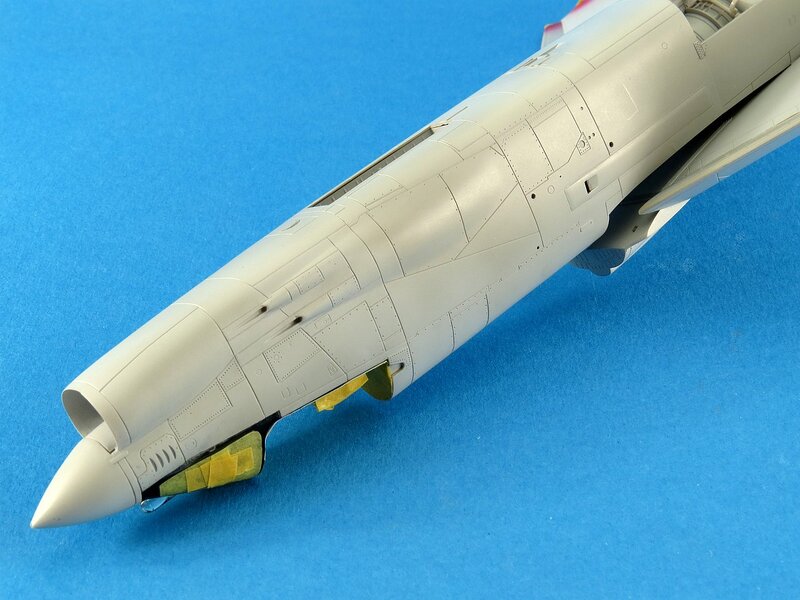 It was necessary for me to adjust the mounting points on the Aerobonus MER in order to fit the Hasegawa pylon. 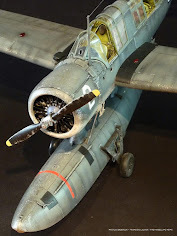 To do this I moved the aft mount on the MER forward by about 5mm. You can see in the picture the white plastic I used to fill the hole left from the original location. 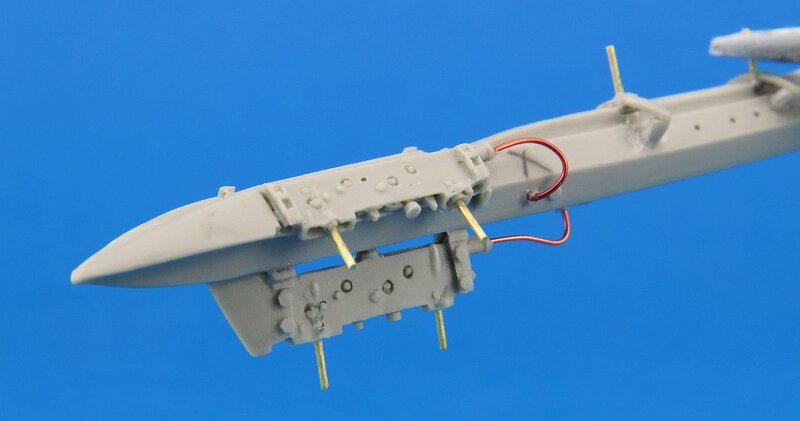 Each Mk.82 bomb was drilled and fitted to the brass pins on the MER. 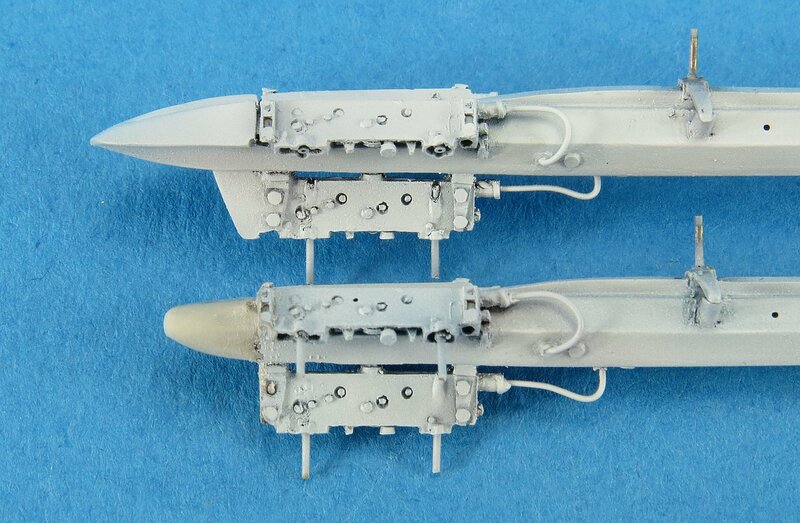 The forward bombs shown here are the two-part resin Eduard Brassin items and the aft bombs are from the Hasegawa Weapon set. 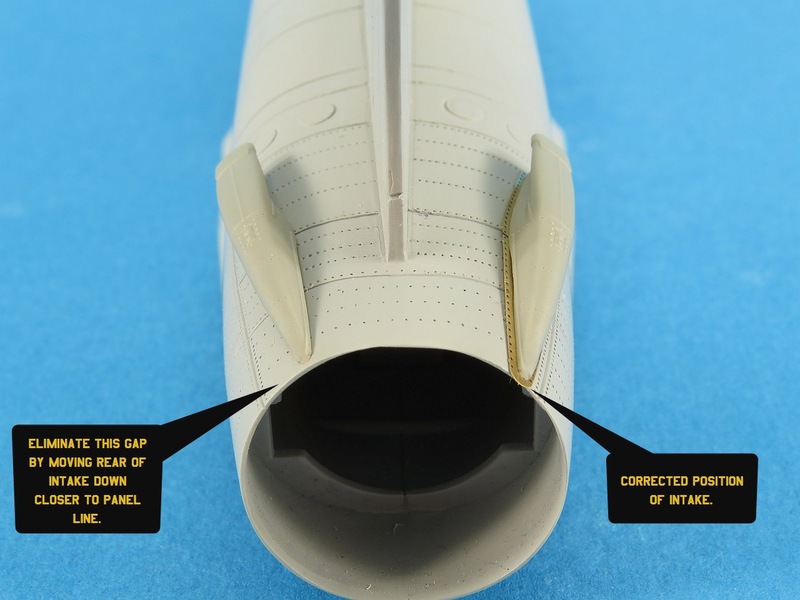 Note the ejection pins marks on the pylon which have been filled with Tamiya Basic Putty. 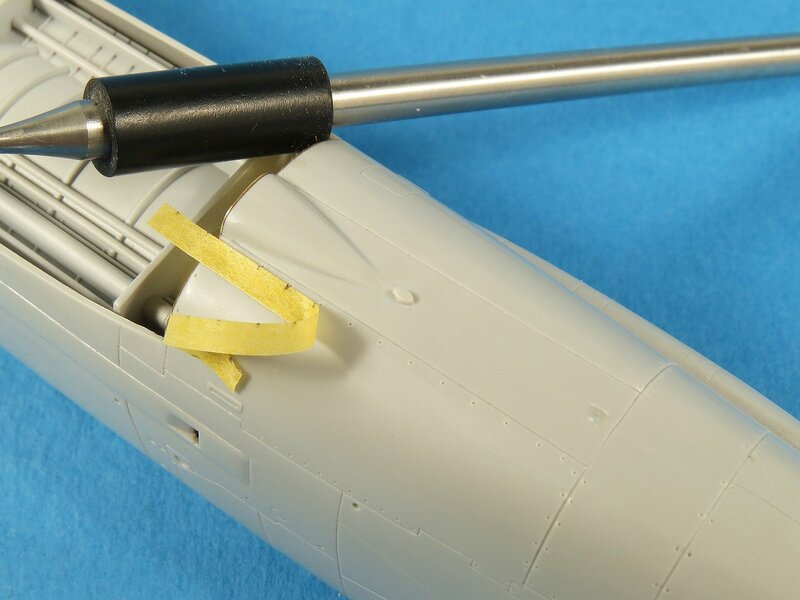 Also note once again the original location of the MER aft pylon mounting sway brace (the small white chip). In case you are wondering what the pencil X's mean they are to remind me which side I needed to drill and pin with brass (ie the outer mounts only on each side). A test fit of the in-progress pylon, MER and bombs to check the alignment is correct. Now is the time to discover problems and rectify them before we get too far advanced. Here we the full load of eight Mk.82's on the two MER's. 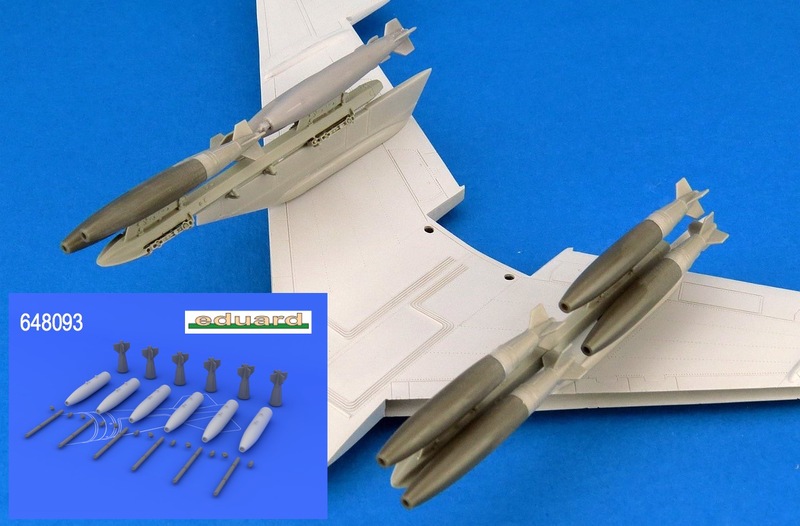 If you are wondering why I used two of the plastic Hasegawa bombs it's because the Eduard Brassin packs come with six bombs and I needed a total of eight. As a postscript to the pylon and MER work, it was not until I had proceeded to the painting stage that I discovered that the early Crusader (and Skyhawks) used an MBR (McDonnell Bomb Rack) and not a MER. Luckily the difference between the two was minor and only required me to reshape the aerodynamic fairing on the nose of the MER. The Aerobonus resin is fairly soft and so it was easy to shave with a knife and then sand smooth. When sanding seams it's often unavoidable to lose some of the surface detail. 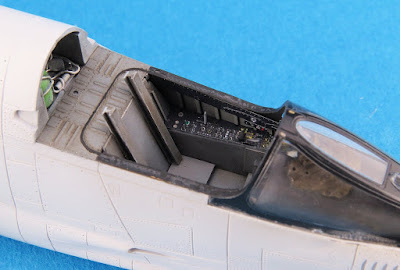 The very rear of the Crusader fuselage is covered in many rivets and to make it easier to see what detail needed repair I applied a diluted mix of black ink. The ink is very thin and easily cleaned off with water after just a few minutes. As you can see it's dark enough to clearly see the loction of each and every rivet to allow me to check those that need attention. 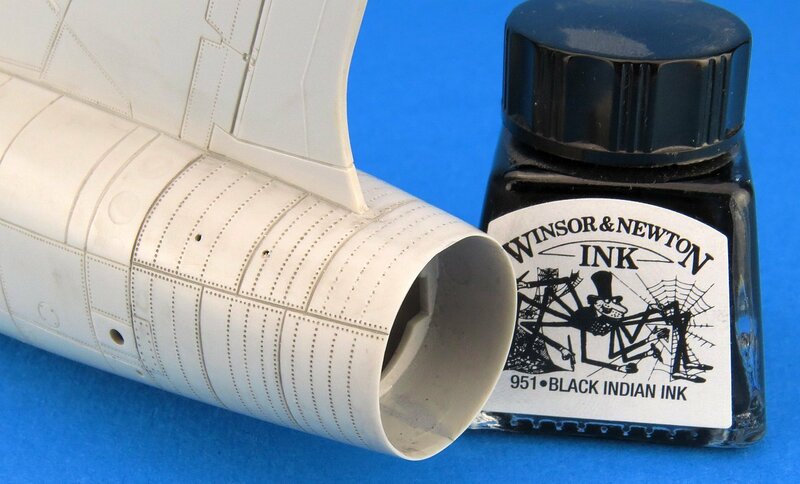 As you work you can apply subsequent coats of ink to check your progress. The cockpit shroud in the Crusader has a canvas boot that covers the area in and around the HUD. I was going to make one up from Milliput but when digging through my spares box found an old resin detail set from KMC designed for the Monogram Crusader kit. 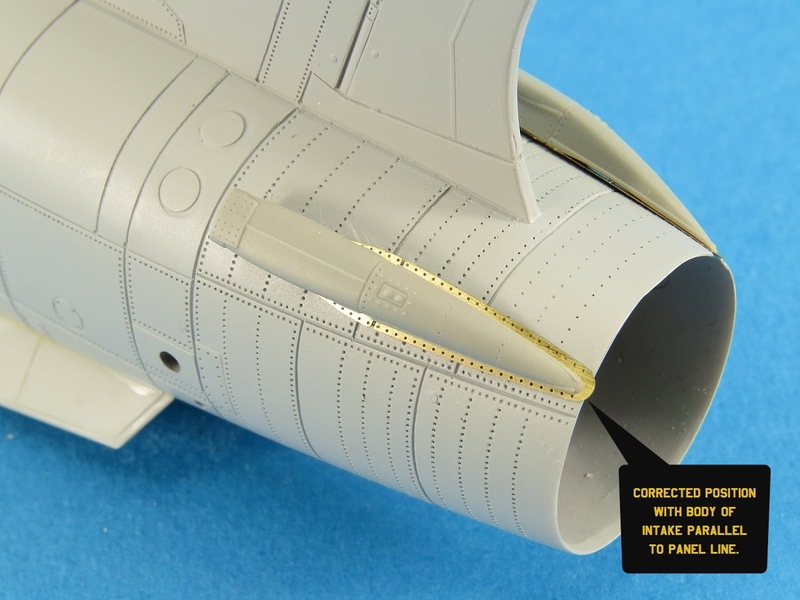 It had a very nice canvas boot and so I liberated this part from the set (I never intend to build a Monogram F-8 anyway). 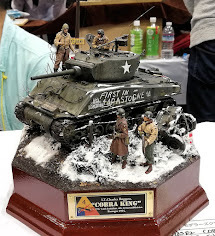 The resin part was slightly damaged and so I repaired it with some Tamiya Two-part epoxy putty. Final touches and photo-etch parts are fitted to the cockpit sidewalls and the rear shelf just in time for masking. I'm not normally a huge fan of pre-painted colour photo-etch but in this case, it actually works very well. 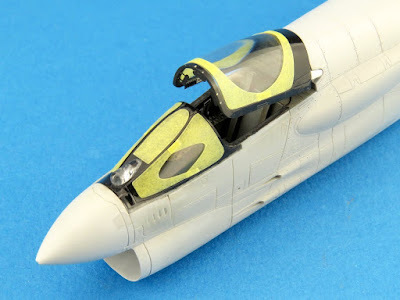 The provided Eduard masks fit perfectly when masking the exterior of the clear parts. 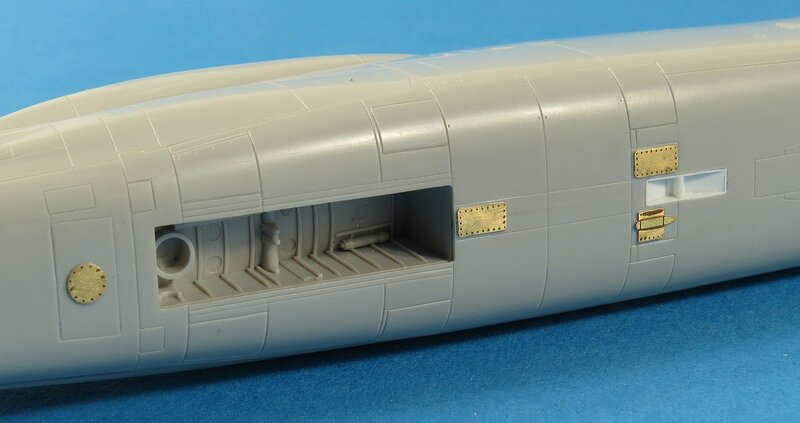 If you look carefully you can also see the pre-painted PE used on the canopy internal framing as well as the three rear view mirrors from the PE set. 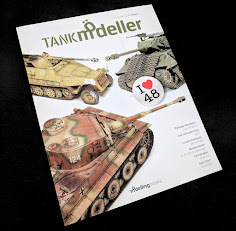 When it first came out I eagerly grabbed some rolls on the new Tamiya Masking Tape "for Curves". 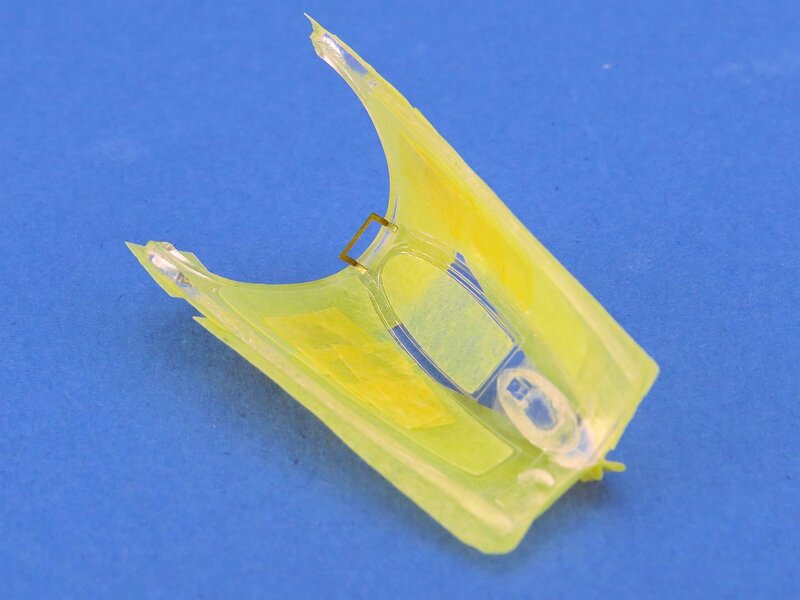 This is a vinyl tape and is able to bend (without kinking) far more effectively than the more common yellow paper-based Tamiya tape. I don't use the vinyl tape very often but found it worked perfectly on the side sills of the cockpit to help me accurately mask the subtle curves found here. The rear bulkhead was masked using a circle template to cut normal Tamiya tape to shape. The main landing gear of the F-8E is pretty simple consisting of two main load-bearing struts with a third smaller retraction strut. 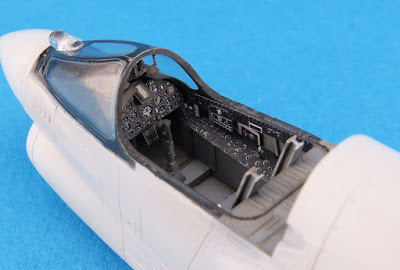 The detail on the Hasegawa parts is nice and is accurate for an F-8E (not so for a later model F-8J) and I proceeded to clean up and assemble the gear prior to painting. 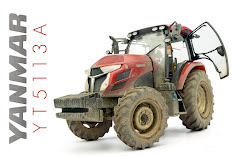 I did want to add a little more detail in the way of hydraulic lines and this was achieved using 0.25mm copper wire and thin strips of Tamiya cut. 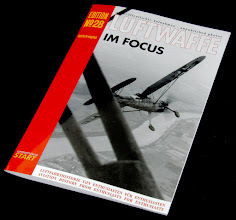 The F-8C saw the introduction of the more powerful P&W J-57-P-16 engine. 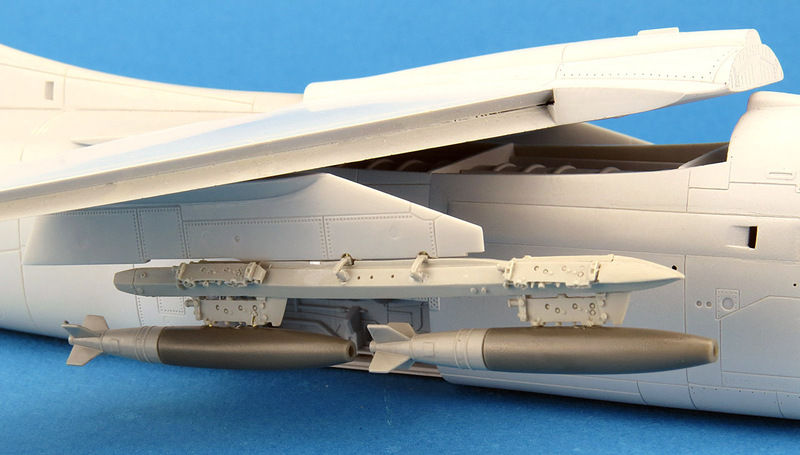 To assist in cooling the tremendous heat generated by the afterburner, Vought added cooling intakes to the rear fuselage on top of the afterburner cone. 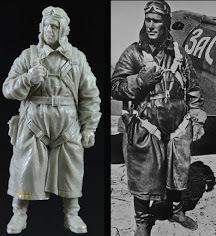 Hasegawa provides these in plastic but Eduard (not included in the Limited Edition boxing) produce much nicer parts in resin (648301). 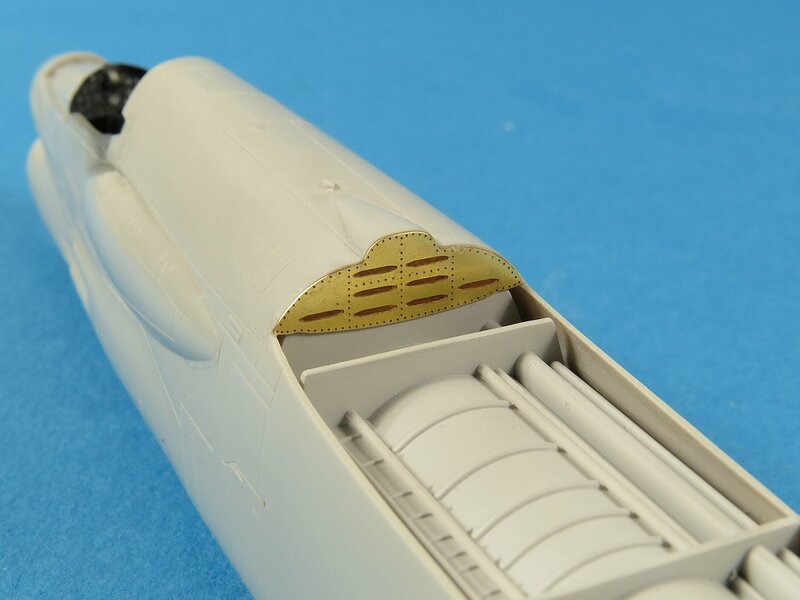 If you use the default position of the locating holes on the Hasegawa fuselage it results in the intakes sitting at the wrong angle relative to the tail and fuselage. 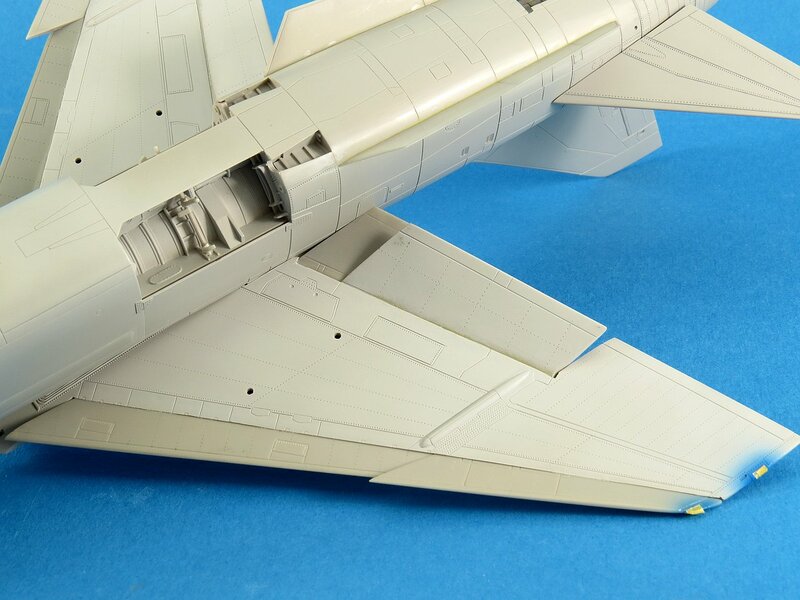 The upwards angle shown in the before picture is incorrect and needs to be corrected (drill a second hole or just file out the original hole) to drop the rear of the intake so it sits aligned properly with the panel line and vertical tail. With all the masking complete it's time for a final 'once over' of the model to make sure I have not forgotten anything before commencing painting. The primer has been applied to anywhere I have done seam or surface repair work to ensure all look clean. 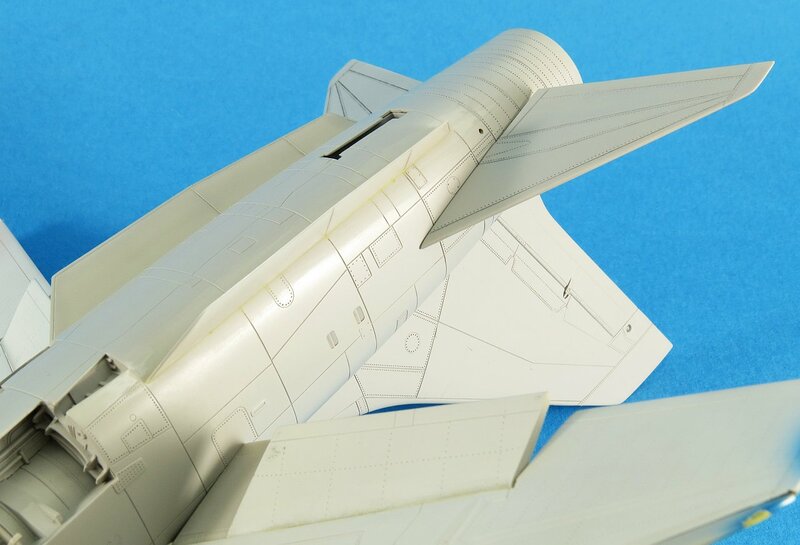 The wing is not glued at this point as I plan to paint it separately (one of the benefits of the Crusader I guess). The wingtip navigation lights have been painted with Mr Color clear Red and Blue and then masked off. 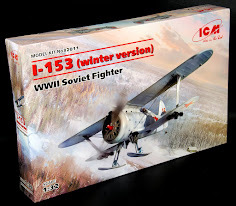 As usual, I spent quite a considerable amount of time checking and sharpening each of the panel lines and rivets across the surface of the entire model. 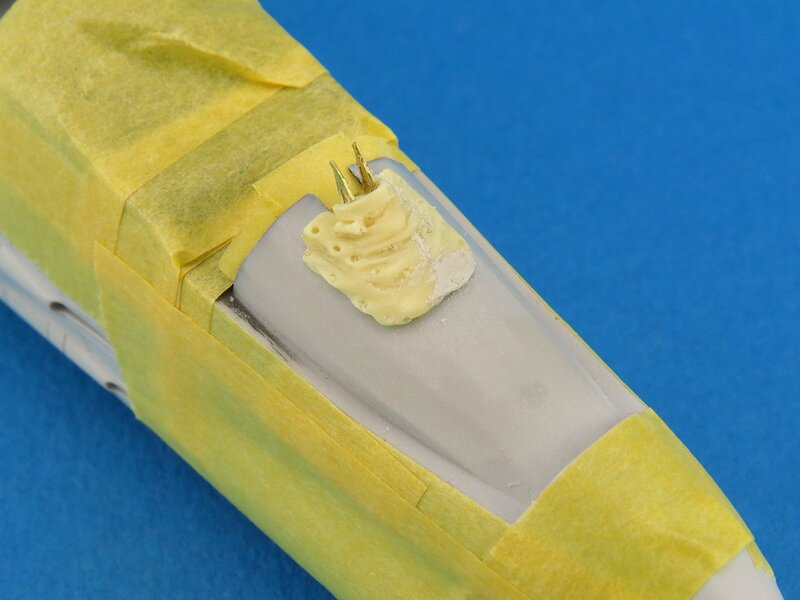 From experience, I know this is needed (especially on Hasegawa kits) to ensure the panel line washes can take hold properly down the track. Milliput has been used in a few places (like on the base of the ventral fins and the flap join lines) to fill small gaps. Rather than sanding when dry I like to blend the Milliput whilst it is still workable with a damp cotton bud. 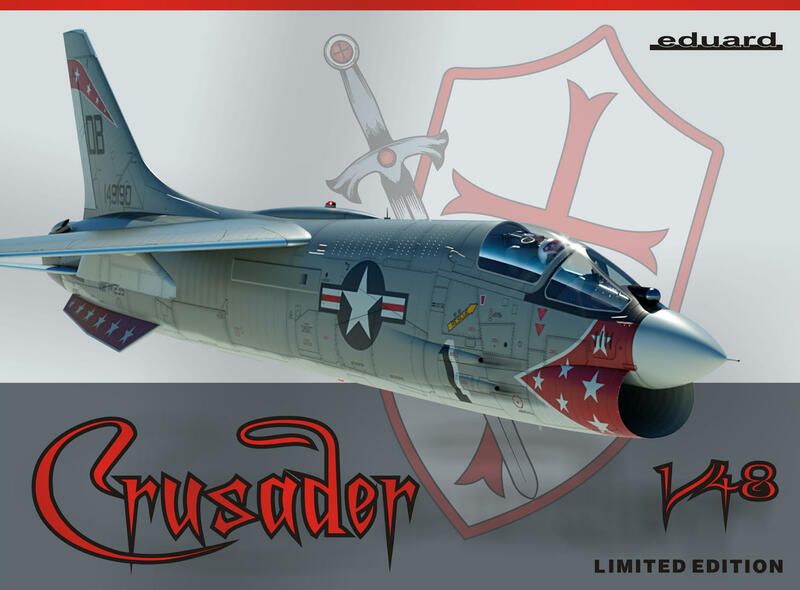 That concludes Part II of the build review of Eduard's Limited Edition F-8E Crusader. 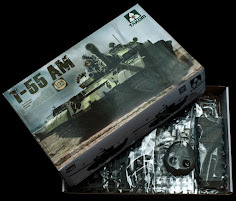 Next time we will see the completion of the model as I proceed with painting, decaling and weathering.